It’s now that I find myself guiding FT towards the little-charted territory of the Wobs sanger vegetarian option, traditionally an unloved corner of the refrigerated unit filled with miserable cranberry and brie combinations (of which I suspect we’ll be seeing more in future weeks). It’s usually been even bleaker for the vegans, who might count themselves lucky with some dry falafel wrap, but this year have literally more than one option, thanks to many of the chains redoubling their efforts to capture this small but vocal market. It’s in this context that we once again find ourselves surprised to be standing in a Tesco Express, confronted by this particular excessively-boxed nonsense. Open it up and out falls an extra (and very determinedly sealed, requiring some use of teeth in my case) sachet of paprika-spiced coconut flakes (“bacon-flavoured” the box says, but w/ev). Overall it breaks a number of the traditional wobs sanger rules. For a start, it takes the non-standard roll form, though more interestingly for the vegans it uses potato instead of falafel for a change. 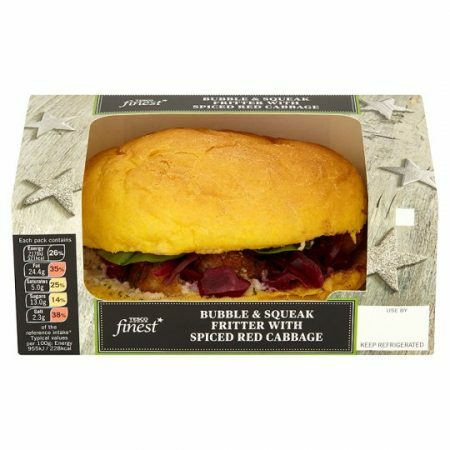 It should by rights be dry and stale-tasting, but it turns out it’s very tasty, with a soft bun (almost brioche-like in consistency) and spiced red cabbage for some texture and moisture. Moreover, a certain trumpet/drum-playing correspondent of FT’s acquaintance has reported this as being the best vegan one in general circulation. I feel like I’ve tried pretty much all of them, and she’s not far wrong, though I’m still holding out for one made with cranberry sauce and Tofurky. For all that it’s still the most popular supermarket in Britain, Tesco seems a bit nonplussed at Christmas time. Its adverts have long been upstaged by the posh end of the market – and this year it got the unwelcome attention of racist idiots too – and nobody makes much fuss about its sandwiches compared to the PR juggernauts of Pret or even Greggs. 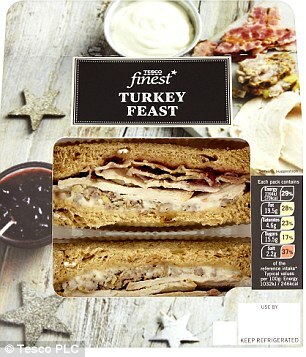 The store does its bit over Christmas, sells everything you’d expect, and I suspect makes most of its money by being open later than anyone else on the 24th – by which time its sandwiches are the last thing on anyone’s mind.